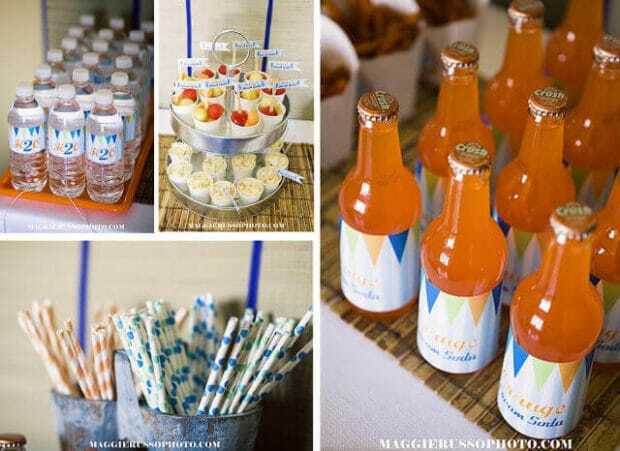 Planned by Sara of The Homespun Hostess for her son Andrew’s 7th birthday party, it features a color palette of summer bright shades of orange and blue from the dessert table all the way to party favors. 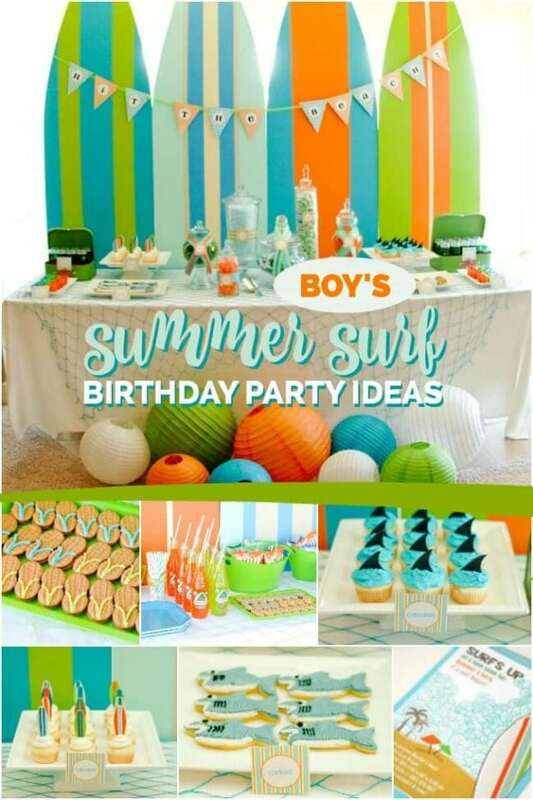 Hit the beach for details from this beautiful boy-girl sibling beach party. 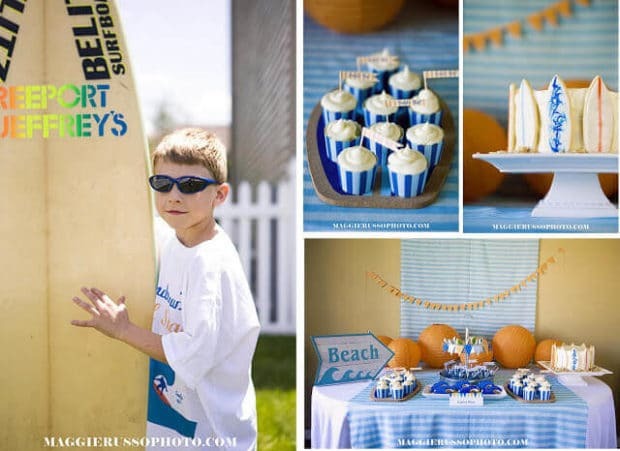 Catch a wave and inspiration from this boy’s surfing birthday party. I love Sara’s approach to the surfing party theme. She reused and repurposed many items from around her home and shopped smart to pick up things needed to pull together a coordinated party. First, let’s talk about the sensational dessert table. Sara used fabric to make a striped backdrop, which she carried to her table as a runner. The color of her walls already coordinated with the party theme—bonus! A simple paper flag bunting was strung across the backdrop, and orange paper lanterns were placed on the tabletop for colorful whimsy. A wooden beach directional sign completed the decor. Sara chose to focus her efforts on rounding up popular party staples—birthday cake, cupcakes, shark infested Jell-O and cookies! OK, the shark infested Jell-O might not be a party staple, but every surfing party needs some sharks. 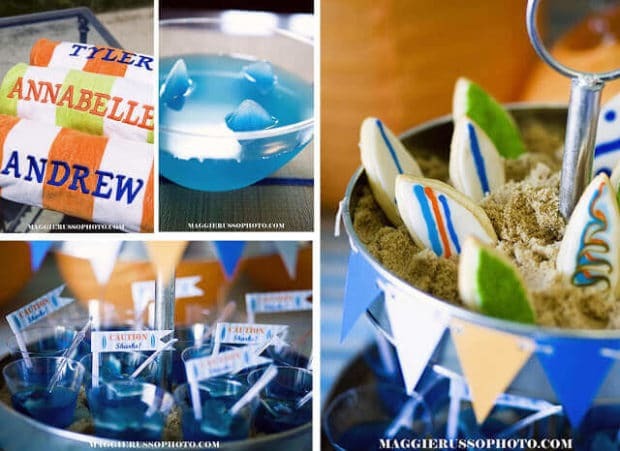 Notice the little “caution sharks” flags in each Jell-O cup—cute! Now these weren’t just any ordinary desserts. Each was detailed and coordinated with the party theme. The cake was a masterpiece with blue ombre layers, covered in white buttercream and accented on the circumference with surfboard cookies. Likewise, “catch a wave” cookies and surfboard cookies couldn’t have been cuter! 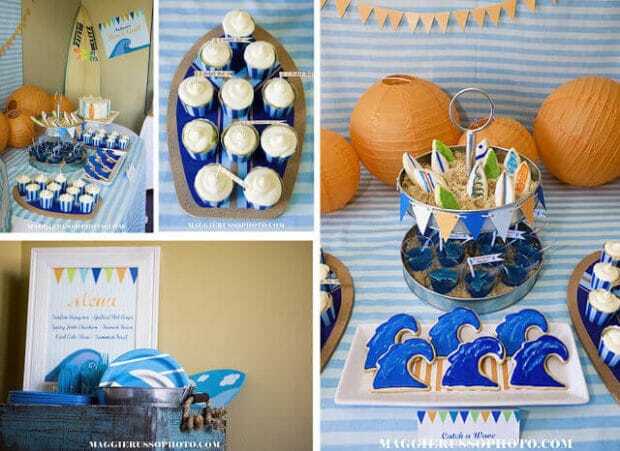 The wave cookies were displayed on a tray with striped orange and white patterned paper, while the surfboards were propped up in more brown sugar sand. 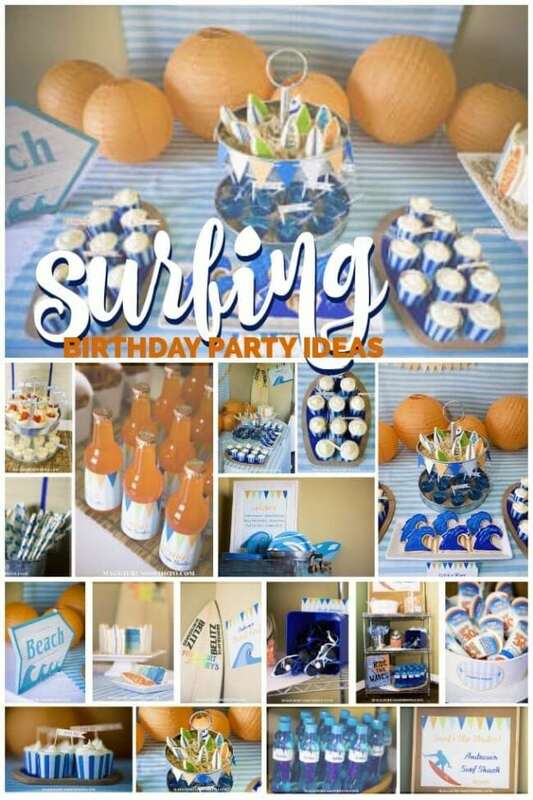 Cupcakes were dressed with “surfs up” party flags on toothpicks. They were served in striped baking cups on top of a cork surfboard Sara picked up inexpensively at a local store. 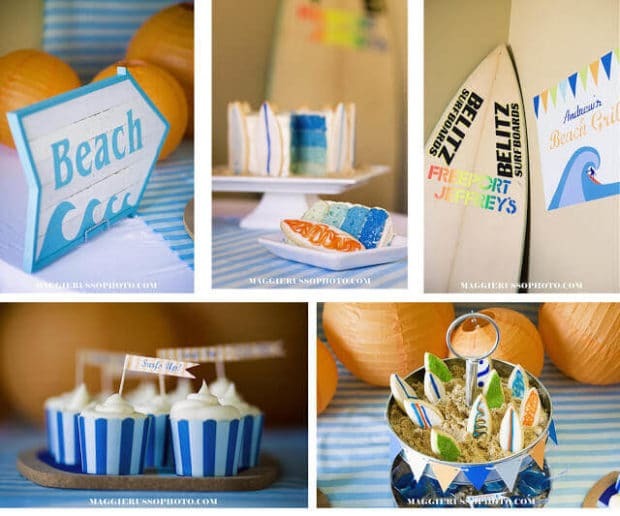 Because surfers need more than just sugar to hang ten, Sara planned a cookout with food served in retro style blue baskets from “Andrew’s Beach Grill”. I love the mini cups of fruit and coleslaw with custom “Andrew’s Beach Grill” food picks. And don’t you think the water and soda bottles coordinate well with their matching labels? My favorite detail has to be the awesome punch bowl complete with shark fin ice cubes. A party favor station was set up on a shelf Sara repurposed from her home. 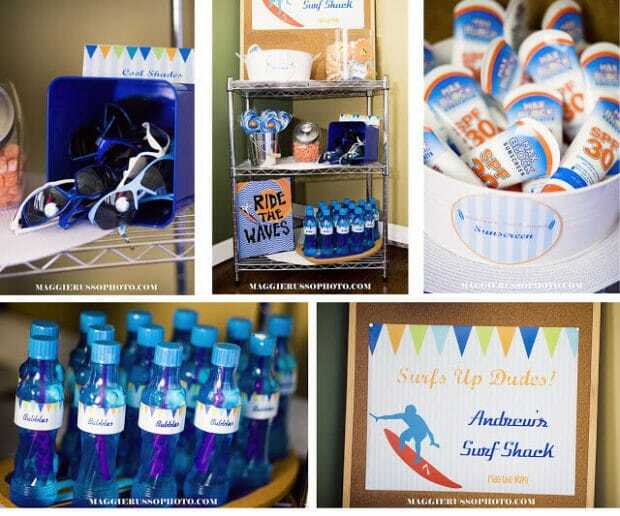 “Andrew’s Surf Shack” had so many fun goodies for guests. From the dollar store Sara picked up sunscreen, sunshine cookie sticks (with custom labels) and sunglasses. Bubbles with custom labels were also a hit, as was the orange candy that Sara displayed in a candy jar. She had $4 beach towels embroidered with the kids’ names as a final surprise. No party planning wipeouts at this surfing party! What a way to celebrate a 7th birthday!